All Terrain Vehicles (ATVs) are 3 and 4-wheel motorized vehicles used for off-road riding. ATVs are used for both fun and rescue as they provide quick and easy access in off-road areas. Unfortunately, every year, many people, including children, are severely injured in ATV accidents. Children under the age of 16 are the most at risk for ATV accidents. Many states do not require a license or training, nor is there an age limit to operate an ATV. A typical adult-size ATV can weigh in excess of 750 and can travel as fast as 75 miles per hour. If you or a loved one has suffered an ATV injury or if you have a question that has not been answered, call us now at 1-(800) 888-8888 to speak with a motor vehicle accident lawyer. The biggest factors in most ATV accidents are driver inexperience and alcohol or drug use. According to one report, an inexperienced rider is 13 times more likely to cause an ATV accident in their first month of use as compared to a more experienced rider. Drug and alcohol use is involved in 30% of all ATV crashes. DUI/DWI laws apply in ATV crashes. Protective clothing, rider training, and proper use of an ATV, are all vital in preventing ATV crashes. Three-wheel ATV’s were involved in so many rollover accidents and injuries, the U.S. Justice Department filed a lawsuit alleging ATVs and their manufacturers violated the Consumer Product Safety Act. In 1987, ATV manufacturers stopped producing three-wheeler ATVs and began making four-wheelers, which provide greater stability. Unfortunately, there are approximately 2.4 million defective three-wheelers that were never recalled. Many of these extremely dangerous three-wheelers remain in use today. Although many ATV accidents are caused by driver error, some ATV accidents are caused by defects. Defective ATVs suffer flaws in the building process. If a manufacturer is aware of a hazard and does not warn the public, he is guilty of “failure to warn”. Design defects are errors in the product design that make the vehicle dangerous. People are winning defective product lawsuits against ATV manufacturers, and hundreds of thousands of ATVs have been recalled since 2000. Razor Dirt Quad – Electric Powered Ride-On Vehicles. About 30,000 Razor Dirt Quad’s have been recalled. The control module for the throttle can fail and cause the vehicle to unexpectedly surge forward, posing a risk for injury. The recall affects product ID numbers beginning with 103110-01 or 103110-02. If you have one of these products, stop using it immediately and contact Razor for a free replacement controller. – Toll Free 800-813-3155 or visit www.razor.com/recall. Kawasaki – Brute Force 750 4x4i model ATV – On some pieces, a nut, which secures the front upper suspension arm pivot bolt, could become loose during vehicle use and cause the upper suspension A-arm pivot bolt to back partially out. This would result in a loss of steering control. Kawasaki has received 14 reports of incidents with three minor injuries reported. Arctic Cat Inc – Prowler XT Off-Highway Utility Vehicle – The recalled units fall within the vehicle identification range (VIN) of 4UF06MPV06T300001 through 4UF06MPV86T300781. The brakes on this ATV can fail. Arctic Cat has received notice of one incident of a brake pad dislodging from the rear caliper, and one incident of foot brake lever flexing. No injuries have been reported. Bombardier Recreational Products Inc – 2004 and 2005 DS650 ATVs – The recalled units are under model numbers 0003A5A00, 0003A5B00, 0003B5A00, 0003B5B00, 000799700, 000799500, 000771900, and 000771700 The rear axle bearings may have not been sufficiently greased and could make the ATV unstable. Bombardier has received one report of the rear axle bearing breaking leading to a loss of control. No injuries have been reported. 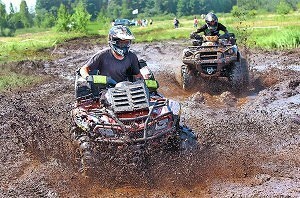 For additional information on recalled ATVs, visit http://www.consumeraffairs.com type in the search box ATV recalls.